Collaboration and Humility in the Vegan and AR Movement. 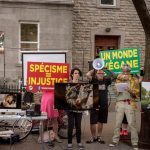 This past Saturday was my second kick at the can (2015 being the first) attending in Montreal, Quebec, Canada, World Day for the End of Speciesim – Journée Mondiale pour la Fin du Spécisme. Both events were successful and somewhat different with participants holding signs, passing out info, engaging interested passersby, showing the film Earthlings, giving heartfelt and informative speeches, offering plant based fare, chalking and generally just being there, one of the most important elements. This year’s event took the form of a collaboration between Résistance Animale and Mouvement de Libération, two grassroots groups in Montreal who advocate for the end to speciesism and the emancipation of all species trapped in and affected by our various death for profit industries. At latest count, we were 70 strong, with people of all ages showing their support for those for whom we stand united. I cannot say enough good things about the short and long term benefit of the collaboration of all advocates, activists and vegans. We are one voice, standing with and for the persecuted in what must be described as the only social justice movement in history in which the victims cannot advocate for themselves. I had a feeling, an inkling at the beginning of the year that 2016 would see the galvanizing and solidifying of this movement, as well as a growing awareness and mainstream coverage. There are so many signs of this happening as we speak and this vegan and AR activist could not be happier and more encouraged. Here is a short list of the oh so good news! 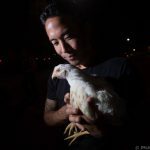 Marc Ching founder of The Animal Hope and Wellness Foundation recently reached out to Anita Krajnc of Toronto Pig, Cow and Chicken Saves, offering to attend one their vigils, to bear witness, to learn, to share. It was, without a doubt, a heartfelt and monumental day for AR activism. Team Vegan is an online Facebook Group which promotes collaborative activism – definitely worth checking out. Vegan Publishers is not a new face on Facebook, but one which continues to promote vegan writers of books. They and the author, Ren Hurst have hit it out of the park with her compelling book, Riding on the Power of Others. Ren is an accomplished former horse trainer and rider as well as hoof care specialist who shares with us her journey to veganism. We are given an explicit and gut wrenching view of the cruel practices and training required to dominate domesticated horses, who essentially are held in captivity and forced through learned helplessness, to accommodate the wishes and perceived wants of humans. Her informative videos confirm that it is possible to share a symbiotic relationship with other species through mutual respect and the non violent setting of boundaries. 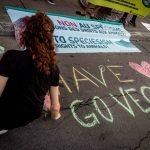 VegFests are cropping up all over the world through the hard work of dedicated vegans and AR activists who seek to include and share the wisdom of experts in the movement. Marcia Katz (Butterflies), who has been a vegan for more than 37 years, took on the daunting task of organizing and executing the South Florida VeganFest, which took place on August 27th, 2016. Reportedly, it was one of the first of its kind in the area and showcased speakers such as Casey Taft of Vegan Publishers and Sarah Woodcock of TAVS. Anita Kranjc of Toronto Pig Save is garnering much needed international attention and mainstream coverage during her trial, after having been charged with criminal mischief for giving water to pigs in a truck bound for the slaughterhouse. Absolute Vegan is a fantastic website teeming with ideas for effective advocacy, such as sticky notes and chalking. There are links to articles, websites, speakers, all of whom and which promote veganism and the emancipation of all species through non violent direct action. 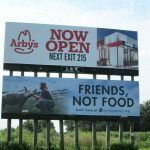 Farm Sanctuary helped Indiana-based animal advocate Lynn erect a very effective billboard under an existing Arby’s sign. How cool and collaborative is that? Toronto Pig Save recently shared widely, a petition created to stop a “Greasy Pig” contest slated to be part of the entertainment at an Ontario Fair. Despite an outcry from supporters of what essentially is child abuse for both the baby pigs and the human children involved, the event was cancelled. Humility is a fundamental element in the ethic of veganism and essential to the continued growth of the Vegan and AR Movement. When we are humble, we internalize the concept that this social justice movement is about those for whom we advocate, thereby opening the door to collaboration. Collaborative efforts harness the strengths and talents of individuals whose passion and sense of justice guide their ethics and their daily lives. Kudos to all my vegan and AR activists who work together to bring about the emancipation of all species currently trapped in and affected by industries which intentionally harm living, sentient beings for profit. Inspiring and exciting! Gives me real hope for our future. Welcome to my website and thank you for echoing my hope for the future and also for the present, because I truly believe that veganism is now! I am so stoked. Thank you for another well written and informative article. I too have been very encouraged in the past few months by the growth of this social justice movement. As a new activist and vegan since April this year I am so humbled and inspired by watching and learning from others; yourself included in this list Anne! I have been inspired by Anita Krajnc from Toronto pig save and am following her trial. I have nothing but respect for her in the way she has conducted herself during this trial so far and I think we need more people like her. I also have nothing but admiration for Marc Ching from the Animal Hope and Wellness Foundation. I listened to his heartfelt speech when he joined Anita Krajnc to bear witness at a recent Toronto vigil. His speech had me in tears, especially when he said he was prepared, “to give his life” in order to raise awareness and to help the animals. These are the real heroes in my view. Activists who are willing to go above and beyond and sacrifice their own lives in order to help others. It can be a very dangerous job. I am learning this and I am sure a lot of activists have been broken mentally too by what they witness on a daily basis in order to make others aware of what is going on in our world and for these people I have tremendous respect. I have also been very impressed with Team Vegan which promotes collaborative activism and I am very much enjoying being part of the team. I am a great believer in team work and I believe if we all pool our resources and differing talents and work together, rather in isolation we can achieve much greater things than if we just work in isolation. We all have the same end goal and as you say Anne we all stand together and are one voice working towards bringing about the emancipation of all species trapped in these industries. As you say Vegfests are cropping up all over the place now. I live in the U.K and I know they have them in London, Brighton, Manchester, Liverpool, Leeds, Hull, Newcastle and Sunderland and I am sure there are others too. I am hoping to go to my first one in Hull in October and also maybe the Sunderland one in November. Thanks again to you Anne and to all the other vegans and activists who are working tirelessly to make our world a more compassionate one! We are making good progress and I am hopeful that one day the sun will rise upon a vegan world. Thank you for your considered comments and continued support. Thank you Anne, for another great post. Working together, collaborating, team work – together we are stronger and we are making a difference. And thank you Rachel – you articulated what I could not! Thanks for the support and yes, i agree with you that working together is key. We stand as one voice, united with and for those for whom we seek protection and emancipation. It is inspiring that activism and interest is on the increase for animals and veganism. We had our first VegFest here in St. John’s, Newfoundland on Aug. 20th and it was a success beyond our wildest dreams. We expected maybe 500 people to attend but there were over 2,500 attendees. Next year will be even better, I’m sure. Also having our first Vegan Potluck on Oct. 17th and there is a lot of interest already. Change is in the air. Thanks for your excellent articles Anne. That is great news about the St. John’s VegFest. have fun at the potluck. Wish I could be there.